« Looking A Lot Like Fall Out There! Some nice weather the past few days. Looks like more tomorrow and into the coming week. 80s tomorrow, then 70s for a few days with 60s over the weekend. Pretty solid generation the past three days. Projection for tomorrow is more of the same. We’ll just have to wait and see what the week brings. Goods news for today was that they kept it at a level that was wadeable in some areas. Scott and his son, Colin, spent last Sunday morning on the river with Carolyn. We worked hard for a respectable day. 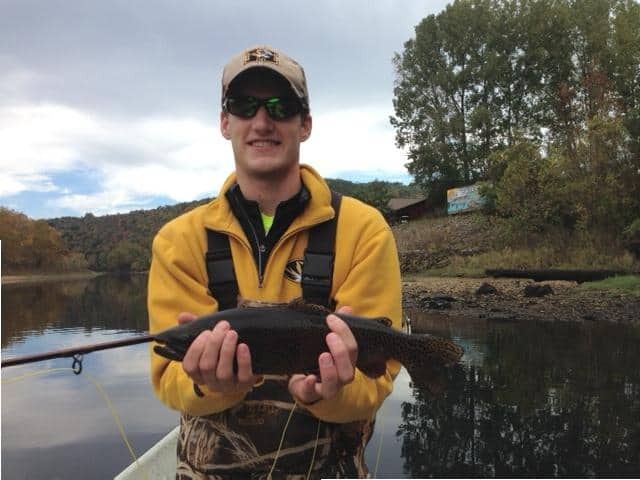 Colin is a fairly new fly fisher, but he throws a nice line and is well on his way to becoming a good fly fisher. Best patterns were the tiger tail and the black copperhead midge. Monday, Stan took Jim, from Virginia, out for the day. One unit on almost all day and it was a good day for them. Best patterns were the P&P, big ruby, and peach egg. Darrell’s guys, Mike and Nick also had a good day Monday. The ruby midge was their ticket for the day. On Tuesday, Sharon from Kansas scratched one more thing off her “bucket list”. 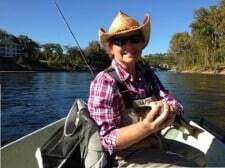 She had wanted to learn how to fly fish, so she spent the morning on the water with Carolyn learning the roll cast, regular cast, knots and even catching a few fish! Fun day with best patterns being the copperhead black midge, the holographic green crackleback and an egg pattern. Think she likes it! Stan had Chris from Illinois out Wednesday. Good day for these guys on the P&P and copper dun midges. Doug and James fished with Stan all day Thursday. Good day for these guys too on the P&P and black copperhead midges. Friday was a little tougher day. Heard from some of the fishers out that day that it was very good early….before 8:30 a.m., but went south after that. Of course, about the time Carolyn hit the water with Mike and Jan. We pulled off a respectable day, but can’t say any one pattern was best. Started out great…I thought. Mike picked two fish right off the bat with the tiger tail. After that, no more hits for him but Jan started catching on the black copperhead midge. After that, I think we threw the whole fly box at them! Gina has Mike from Iowa out for the morning and I think they tried a little of everything. Their best patterns were a rock green soft hackle, #18 grey scud and the black copperhead midge. 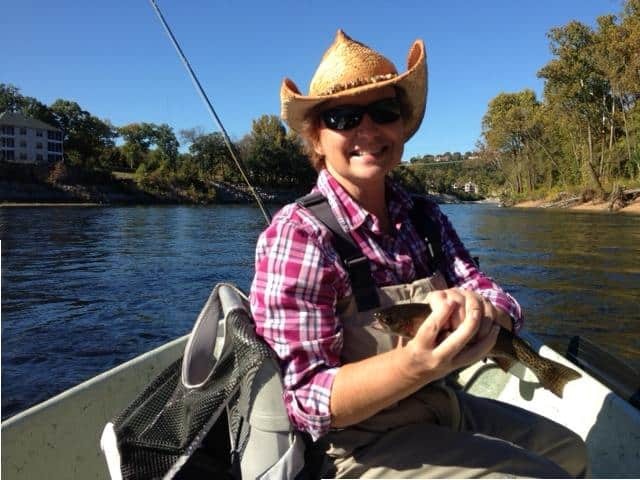 This entry was posted on Sunday, October 26th, 2014 at 4:31 pm	and is filed under Fishing Reports. You can follow any responses to this entry through the RSS 2.0 feed. You can leave a response, or trackback from your own site.